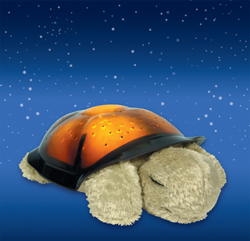 Comforting and adorable, the Twilight Turtle nightlight projects a complete starry night sky onto the walls and ceiling of any room, making night-time less scary and more fun. Choose from three soothing color options to create a magical, tranquil environment that helps children from age three and up to ease into restful sleep. Projection of starry night sky for tranquil sleep. Hand-painted details contribute to an artistic look. Illustrated Star Guide helps identify constellations. The soft glow also serves as a night light. Project the night sky in your child's bedroom for a magical, tranquil sleep. View larger. The winner of several industry awards, including the Editor's Choice blue ribbon from Baby Talk, each Twilight Turtle is individually hand painted for a unique, artful look that complements any nursery or children's room. Plush and soft, with a sturdy plastic shell, this nightlight is best placed on the floor in the center of the room, where it projects a starry night sky onto the ceiling and walls. For interactive fun, parents can also sit with their children and identify and describe the features of eight major constellations, including the Big Dipper and the Big Bear, with the help of the beautifully illustrated Star Guide. The Twilight Turtle also includes a warm-hearted story about how Twilight Turtle, separated from his father, uses the constellations to find his way home. Simply pressing the button on the turtle's shell ignites the stars and keeps them glowing for a full 45 minutes--just enough time for most children to drift into sleep. At this point, the Twilight Turtle automatically shuts off to preserve battery life. Another push of the button reactivates the projection. In addition, the easy selection of the three soothing color choices allows your child not only to learn to identify different colors, but also to truly experience them as well. Amber radiates warmth and peace; green creates a healing and renewing atmosphere; and blue helps calm the senses. The soft, illuminating glow the Twilight Turtle emits also serves as a nightlight that makes the darkness less frightening. A great gift for children who are afraid of the dark, or even adults who have trouble falling asleep, the Twilight Turtle runs on three "AAA" batteries (included). It also comes with a certification of adoption, and measures a compact 14.0 x 5.0 inches (WxH), so it's easy to display and store. Cloud b, the baby sleep specialist, was established by two new mothers with the philosophy that every baby deserves a sound night's sleep for healthy development. That's why all of Cloud b's products are developed in consultation with an advisory board of pediatricians and sleep specialists with a single focus: to achieve a better, safer sleep for baby. Twilight Turtle, Constellation Guide, adoption certificate and three "AAA" batteries. 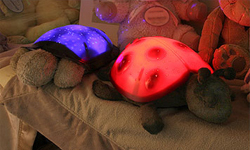 Twilight Turtle gently transforms nurseries and bedrooms into a starry sanctuary that comforts and calms children. From within his plastic shell, Twilight Turtle projects a complete starry night sky onto the walls and ceiling of any room. Choose any one of three soothing color options blue, green, and amber to create magical, tranquil environments that are ideal for helping children of all ages fall asleep easier. This is my second time buying this as a gift for a one year old. They loved it! They said the first night as a family they were all in the room together and Makala was mesmerized by the lights. Loved by the little one; "it's magic" she said. 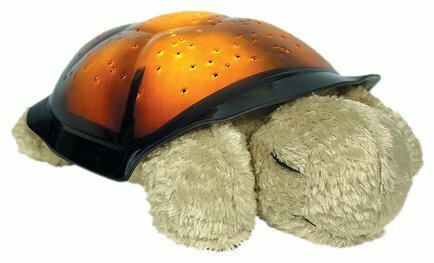 Our three year-old daughter loves this turtle - she uses it every night and can't seem to live without it. We would buy this again for her - or any other child we know that likes to have a night light in his or her room. I was SOOO disappointed when my Turtle broke down only after a week. It did help my kid (age 22 months) sleep at night, he actually looked forward to going to bed, so much so, that he and my other child (3 years) were fighting over who was going to sleep in that room! It really did wonders paired up with the Sleeping Sheep (which I added Essential Oil Lavender to) that makes white noise. DESCRIPTION: Of course in the beginning, when I took it out of the package, you could definitely tell this little guy is NOT to be played with. I got that, it's very light the body is plush and the shell is plastic similar to thin PVC material. If you stepped on it, it would probably shatter in a thousand sharp pieces. With that thought I NEVER let my kids handle it. PLACEMENT: I read the directions, which state, it needs to be placed at least 6 ft from the ceiling or less AND in the center of the room, to view the stars correctly. I don't happen to have anything in the middle of the room to set him on so I set him on the dresser and the stars show up nicely in most areas, the outer edges the stars stretch and get blurry because of my improper placement. It is not ALL over his ceiling, but they are on the ceiling and the wall, and he loves it, what more could I ask for? COLORS: I agree that the Amber lighting isn't very viewable UNLESS it is pitch black. I just don't use Amber lighting, his favorite is blue or green. Blue shows up the best for us. FUNCTION AND FAILURE: He is adorable for looking at, and I was so upset when (only a week later) he would no longer turn on. I changed the batteries and still nothing worked. I found the the green lighting button stayed depressed and would no longer pop up. I attempted to unscrew his battery pack to see if I could get inside of his shell to "pop" his button back up, but apparently his shell is actually one big hard case and you can't actually get "into" him at all. So that begs the question, what happens when the lights burn out? Hmmm... Well, that won't be a problem for me since he won't work anyway. I think the price is a bit steep for a weeks worth of use... But when he worked... he was wonderful! Finally something to help my daughter go to sleep!! As I sit in a hospital tonight there were two things my son wanted from home for his first night in a hospital. His Speed Racer blanket and his turtle. This has provided him the night light for him for 3 years now. Several friends have seen it and convinced their partents to get one. He loves the blue but when only yellow is available due to the batteries being low he is fine with that. We have gone 4 months or more on one set of batteries as a result. He did rough house it a bit pulling part of the shell away from the body but he does not care much. Even if he did this is the type of toy that could be replaced and he would not know, which is better then other items of affection such as a blanket or stuff animal that fades and he would realize the replacement. The item projects a starry night sky onto the walls and ceiling, but to have this sky looks nice the lamp should be in specific position, in the middle of room and not far from ceiling. We just bought it for our baby room and it is fantastic! It lights up in 3 different colors and comes with a constellation guide. the only thing is it need to be on the floor so it can have enough room on the ceiling to have a full picture of the stars, so you can find constellations. My Son's Favorite Night Light..